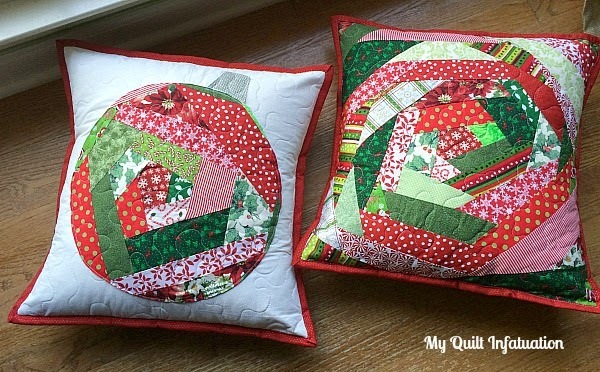 My Quilt Infatuation: Christmas Pillows and Giveaway! Oh my,I am in love with both of your little pillows! Great work on your first applique! Thanks! Very cute pillows! I like how they have envelope opening for easy cleaning. I think I would shoot for a Christmas quilt first of all, maybe the size to hang off a bannister rail, or foyer wall. I would love to make a Christmas snowball table runner. Your pillows are very pretty. I also like the envelope opening in the back so they can be taken off to wash easily. Thank you for this awesome giveaway. I would love to use them to make a Christmas quilt or a table runner and maybe place mats. Oh, Sweetie, you can send those scraps to me so I can continue making gift bags with them! My plan is to have so many fabric gift bags for Christmas that I don't need to buy, use and throw away paper wrapping paper! I would definitely put them to good use! I would love to make a Christmas wall hanging. Thank you for the chance. Your pillows are perfect for adding holiday charm to the house. Love the envelope back. I would use them in a lap quilt, maybe the Four Patch + x's and O's pattern. Thanks for the chance. I would make a set of pillows to add to the Christmas feel of the house. Pillows, table runners, stockings and if anything is leftover, pot holders! Thanks for the nice giveaway. Wow, your scraps look awesome! I would make a wonky star quilt with your cute scraps. And maybe a few pillows to match. Now if I could only finish my Christmas quilts with fabric bought last year. One top is one--that counts, right?! I would love to use these for baby or toddler quilt. They are so cheery! Your pillows are precious. I would like to make some placemats and a center cloth for Christmas and these scraps would work great! I love those pillows!! And I'd use them for a Christmas quilt! Scraps would be nice for little happies and ornaments. It sounds like fun. I want to make stockings. Fun giveaway. Thanks. Wow, I'd love these scraps!! I'd make a tree skirt and some couch pillows. Your new ornament pillows are fantastic. Congrats on your first applique. I have a Christmas Ornament scrap quilt that this would be perfect for. Love your pillows. I would make pillows, table runners and placemats. I love to have Christmas themed table dressing at this time of year. Oh My Word, I love scraps and bright colours, this is a double whammy. I make a Christmas quilt or pair of pillow covers for my daughter every year and this would set me up ready for next year. If I were fortunate enough to win I would gladly cover the shipping charge to the UK. I love your pillows! I would make some too! Thanks! Great job on the pillows! I'd like to make a quilted Christmas tree skirt. It's one of those projects I say I'm going to get to every year. Your stash could really get me motivated! Wonderful pillows! I would like to make a table runner if I win. I have so many scraps patterns, I will make a good use of your scraps. Thanks for the giveaway. Your first applique project couldn't be more creative and fun! The obvious choice for using your scraps would be pillows - and Christmas stockings - everything would be made VERY scrappy and festive. I so enjoy your patterns and blog. I am waiting for a fabric company to "discover" your vision for designing. Ooh. I'd love some Christmas fabric scraps. Thanks for a chance to win. I'd use them to make a festive table runner. 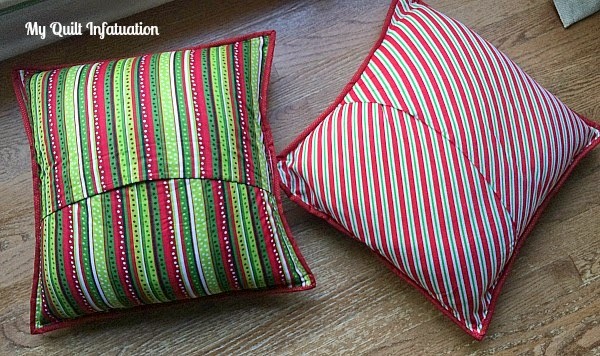 I would love to make Christmas pillows with your scraps- time to remove the pink ones from my sofa! Thanks for the giveaway. I don't have much Christmas fabric. I love Christmas just haven't made alot of Christmas things. I would love to make a few pillows or maybe it's time for a Christmas lap quilt. Thanks for the chance to win. I'd make a Christmas throw to cuddle up under during our cold MN. winter:) Thanks! Cute pillows! I need to tame some of my strings that way. Thanks for the chance to win the gorgeous scraps. I have a little tree wall hanging that I'd like to make. They would work for that! 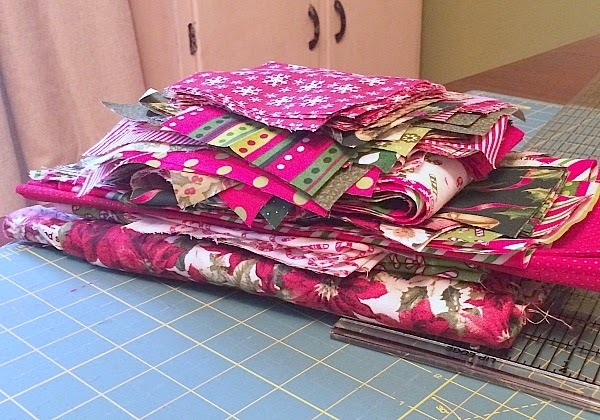 I would love to make a lap quilt- All Wrapped Up- with these scraps. I would probably use them to complete a xmas wall hanging that has been a UFO in my closet for quite a while!! On a mission to use my scraps now and succeeding, but a few more would be nice. Thank you for chance to win more. Beautiful pillows, will have to try something like them. Your inspiration is so appreciated. I love your bauble cushion - I'd love to make some as presents! Love your pillows. I think I would make a tree skirt out of the scraps. I love your scraps. I am making a Christmas village out of scraps and could use some to add more color to it. Oh how fun! I even BUY scraps, as I love to add colors to my already huge scrap pile! I would make tiny zipper bags, and pin cushions, as no scrap is too small to escape my attention! Literally! Hi Kelly! I would mix your Christmas scraps in with mine and make a Christmas quilt for my daughter. Thanks for the opportunity! I would start with a lap quilt, then place mats and mug rugs until the scraps were all gone. Those look cute for some ornaments. I would make a Christmas tree skirt. Cute pillows! I wanted to make a Christmas quilt this year but I have no Christmas fabric except a couple scraps from my minky blankets. That is crazy! I decided to be better prepared for the holidays next year. Love your pillows. I know some hate appliqué but I love it! I was surprised how easy it really was my first try also! Well, I just started quilting, so I'm sure I could put them to good use. I'd like a Christmas throw on the back of the couch. My children had Christmas quilts growing up. I would make a Christmas quilt for a grandchild. The scraps would definitely be turned into more pillows, yours rock!! Thanks for the chance! Your pillows are just beautiful and with your scraps I'll make runner and pinecone. Sew cute Kelly! Congrats on doing your first applique! I'm not in the running for your pretty Christmas scraps, but just wanted to say that I love your pillows! I absolutely love the pillows! Gorgeous! I would make a Christmas tree skirt with the scraps. I would like to make Christmas pillows. I wold make a Christmas quilt for my sister. your pillows have worked a treat, love the crazy style. Having got a new table I think I would make a runner and some mats if I was lucky enough to win your scraps. your pillows are seriously cute. I would love to make some pillows for our daughter who has just plain pillows and because she is so busy she doesn't have time to even decorate, pillow for my sister who only does a tree with decorations because she is so busy, thank you. I would love to make some pillows for my guest room - we are having lots of company for the holidays and it would be great to make the room festive! I would love to have this variety of scraps. I have wanted a Christmas quilt for a few years but never seem to have time to get it all together. I would love to make some pillows for gifts. Thanks for the chance! My guild makes placemats for Senior Center lunches and for other Senior homes so I would use the scraps to make placemats. We make placemat kits which our members take home and sew and return. Also, we have sewing days to make kits or for philanthropy sewing. In addition to the placemats, we make quilts and pillowcases which are donated to various organizations which benefit children and adults in need. Thank you for offering to share your scraps. Many of our members donate fabrics from their stashes or the remnants from a finished quilt. I could go nuts with that fabric. On my to-do list for holiday sewing is some potholders, little fabric ornaments, possibly some log cabin holiday pillows... those scraps would work well for all of them! I have a pattern for a patchwork Christmas tree wall hanging that I really have been wanting to sew. I haven't made it because I don't have enough Christmas material in my stash. I would love to win some of yours so I can get the tree done for this (or more likely next) Christmas. I love making small holiday items that I can give as gifts! Table runners and pot holders are my favorites. Love your pillows too -- maybe I need to start making pillows as gifts. I've been wanting to make a christmas table runner and some place mats, so I'd use them for that. If there was enough left, I'd make a wall hanging or a cushion cover too. We have so little x-mas decor.....Perhaps a tree skirt. I would love to make some pillows like yours, so beautiful! Thanks so much for the giveaway! Love your pillows Kelly! What a fun giveaway. Maybe pillows and a tablerunner. Love scraps. I would make runners or wall hangings with them. Thanks for the generous give away. I just got married at the end of September, so those scraps would go towards our first Christmas quilt in our new home. :) Thanks for being so generous with your scraps! My husband and I love to decorate the whole house for Christmas. Your fabrics could become one or more Christmas quilts to add to the decorations. Thanks for the giveaway. I am now working on a scrappy Christmas quilt - would really like to add more variety! Thanks for the give away! I would make a lap quilt and a pillow or two. I need more Christmas items to decorate my house. I love the pillows you made! I am making table runners for gifts and these would make great seasonal gifts to share. I also like the pillow idea. Love your pillows! Fabulous! The backs are very cute too. I am making Christmas blankets for my two newest grandchildren, it is a tradition. Your scraps would be perfect. Keep those little fingers and eyes playing I spy Christmas. I'd make some Christmas pillows. Love your ideas! Your scraps look terrific - I like the idea of making scrappy quilt as you go stockings with them. I like your pillows too. Love your pillows! I think I'd make some quilt-as-you-go pillows, much like yours on the right. I would love to make a little quilt for my 4 yr old for Christmas. She's just old enough to start enjoying holidays. Yay! I love doing the scrappy look. I would use your fabric in some quilts for our "AUSSIE HERO" QUILTS. There's never too much Christmas fabric for a good scrappy quilt!! Thanks for being generous with some of yours! Started quilting this year - addicted now ofcourse!!! Have not built up a stash yet so would love some - especially Christmas fabric which if my favorite season. Would make a pillow for sure - only the 2nd I have done - and would love to make a scrap Christmas quilt - would a first. Thanks for your wonderful blog! Thank you for this opportunity. Since some of the fabrics have the Christmas fabrics, but no symbols, I think I'd make a nice wall hanging for my classroom. After that maybe some cute ornaments that I'd use as gift tags. Also I've been wanting to try a rag rug. Oh my the ideas are limitless. I would love to make a scrappy holiday lap quilt for my dad who could use some cheering up! Christmas scraps....what a great idea...and baubles would be great!...thank you. I love to make string quilts and your beautiful fabrics would make a very festive holiday quilt. Thanks for a chance to obtain MORE fabric! Lovely!!! I would make table runners for Christmas gifts!! Thanks for the chance!! Love your ornament pillow. I'm a huge fan of making pillows with scraps so that's what I'd do! I'll make a hexie quilt. I think it would turn out cute all made up with holiday prints. I am knee deep in Christmas sewing projects. Would like to do a wall decoration with an embroidery hoop with a quilted piece inside; like a christmas boubles. Also working on stockings for family members! Christmas projects in full swing now! Love your cushions. I feel a scrappy Christmas quilt coming on. Thank you for the giveaway. Hmm, so many choices, but I think I would do some scrappy mug rug's for Christmas gifts. thanks for the opportunity. Since I don't have a Christmas quilt, I would use the fabric to make a quilt using the design you used on your Christmas pillow. The blocks you made are really cool, and the colors are very coordinated. Thanks for the chance to win fabric. Your ornament pillow is adorable! Those scraps would work up well for some Christmas place mats and a table runner. 'Tis the season! tea towels and a table runner. Thanks for the chance to win! Your cushions are lovely Kelly. I think those scraps would make a lovely table runner. I'd love to make a table runner, or maybe a tree skirt, with the scraps. I would make a baby quilt for a special Christmas baby in need. I'd use them to help make a tree skirt -- we don't have one! I started a Christmas Strip Twist quilt that I needed more variety of holiday fabrics to use. This scrap bundle would be just what I need to finish this quilt for a gift. Place mats would be cute! survivor9872@yahoo.com! Probably a table runner. I love scraps! I would love to make a table runner for Christmas! Yay for Christmas! I'd like to use them for making ornaments. I would make napkins and a table runner for the holidays. Thanks for the awesome giveaway. A table runner, Christmas patchwork stockings, and Christmas coasters. Thanks for the giveaway. that I would use to make my daughters quilt, she wants hers to be in pinks and oranges ! I'd probably make a quilt or some pillows. Great job with your pillows! I really want a Christmas nested churn dash quilt and these would be perfect! I'd like to sew some of my own Christmas pillows and wall pendants with these! A table runner would be really cute with your ornament design and fabric. Thanks for the chance.